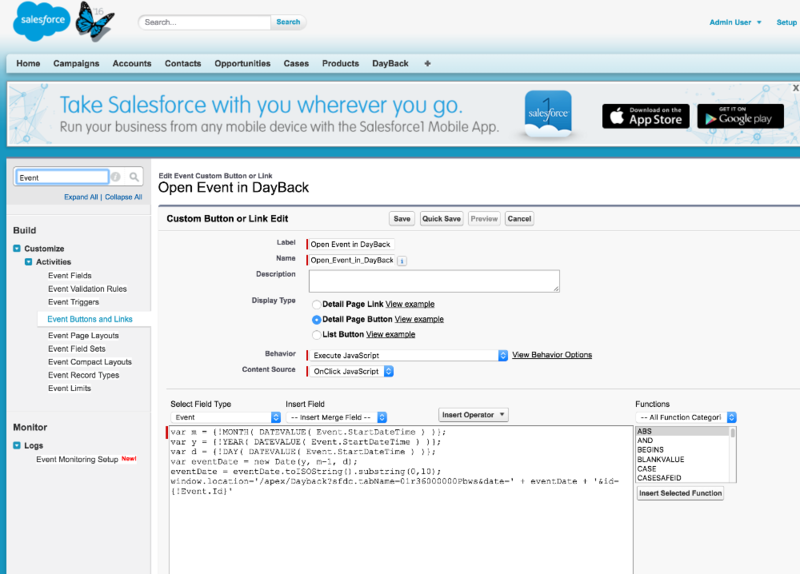 You can jump right to a specific item in the calendar, or show all the items related to a given record, by adding DayBack buttons to your own Salesforce layouts. This effectively lets you filter the calendar using your own criteria embedded in buttons. A couple detailed examples follow. If you have trouble making your own, have questions, or really want to extend what you see here, please get in touch. We love making these for our customers. From the Setup menu, search for "Event Buttons and Links" in the Setup Quick Find. Note that this is basically building a URL for DayBack. This url will be different for every Salesforce deployment. To find yours, just navigate over to DayBack and take a look at the url; copy that text including the tab name like this: "https://dbk.na30.visual.force.com/apex/DayBack?sfdc.tabName=01r36000000ANpO". You want to use that in the code above, before "&source=Events&date=" in the last line. Replace the url (through the tab name) in the code above with your DayBack url. Click "Save". You'll add this to a page in the next step. in the Setup Quick Find, search for "Event Page Layouts" and then click on "Edit" beside the layout on which you'd like to add this button. Visit you event layout and try out your new button =). From the Setup menu, search for "Opportunity Buttons and Links" in the Setup Quick Find. Or use the "...Buttons and Links" option for any object in Salesforce. Note that this is basically building a URL for DayBack. This URL will be different for every Salesforce deployment. To find yours, just navigate over to DayBack and take a look at the URL; copy that text including the tab name like this: "https://dbk.na30.visual.force.com/apex/DayBack?sfdc.tabName=01r36000000ANpO". You want to use that in the code above replacing the URL in the line beginning "var url". Add this button to your opportunities page, following the instructions in steps 7 through 9 in Example 1 above. Visit your opportunities layout and try out your new button =). Note that in the first line you can load other libraries as part of these buttons. Handy. in the movie that begins this section you'll see that adding "filterProjects=..." to the URL adds a section to the Filters sidebar in DayBack: a section titled "Project Filters". That will hold any filters you've loaded via URL-buttons like this. These filters can be turned on and off like regular filters and will persist for the duration of the user's session. If you'd like to clear the filters before that, add "filterProjects=null" to the URL and the Project Filters section will be removed from the sidebar. Source The simple example above included the source as a URL parameter so that DayBack knows to turn on the calendar you're interested in. Without this parameter, the event you're looking for could be in a source that is currently filtered off: without a source specified the "Events" calendar may not be on when you arrive a DayBack. Format: source=Events where "Events" is the name of your calendar in Administrator Settings / Calendar Sources. Format: filterText=Some%20Text. To clear the text filter use filterText=null.